One of the key features of the post-2008 gold boom was the notion that inflation was soon about to take off due to Bernanke’s money printing. To me, this signifies that the deflationary forces in the economy have so far far outweighed the inflationary ones (specifically, tripling the monetary base), to such an extent that the Fed is struggling to even meet its 2% inflation target, much less trigger the kind of Weimar or Zimbabwe-style hyperinflation that some gold enthusiasts have projected. The failure of inflation to take off (and thus lower real interest rates) is probably the greatest reason why gold’s price stagnated from 2011 and why gold has gone into liquidation the last week. With inflation low, investors became more cautious about holding gold. With the price stagnant, the huge gains that characterised gold’s rise from 1999 dried up, leaving more and more long-term investors and particularly institutional investors leaving the gold game to hunt elsewhere for yield. 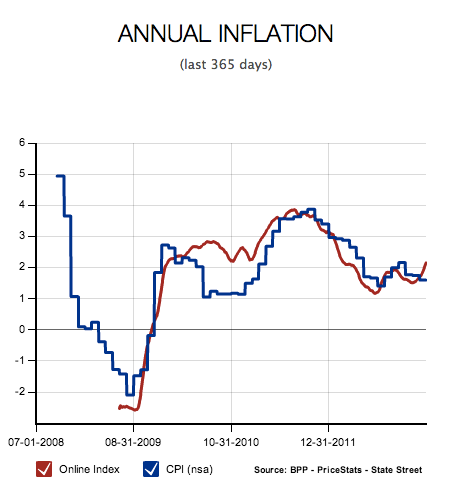 I myself am an inflation agnostic, with deflationista tendencies. 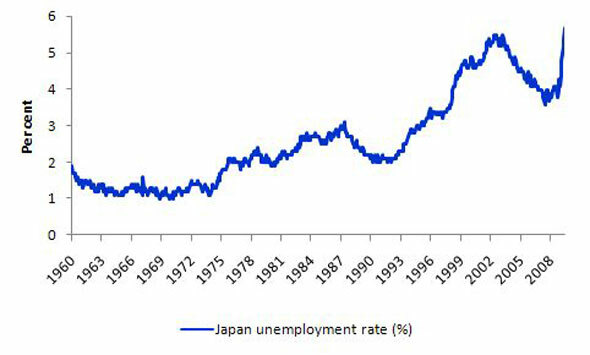 While I tend to lean toward the notion of deeply-depressed Japan-style price levels during a deleveraging trap, price levels are also a nonlinear phenomenon and could both accelerate or decelerate based on irrational psychological factors as much as the level of the money supply, or the total debt level, or the level of deleveraging. And high inflation could certainly take off as a result of an exogenous shock like a war, or series of natural disasters. But certainly, betting the farm on a trade tied to very high inflation expectations when the underlying trend is largely deflationary was a very bad idea, and those who did like John Paulson are being punished pretty brutally. The extent to which this may continue is uncertain. Gold today fell beneath its 200-week moving average for the first time since 2001. How investors, and particularly institutional investors react to this is uncertain, but I tend to expect the pendulum to swing very far toward liquidation. After all, in 2011 most Americans named gold the safest investment, and now that psychological bubble is bursting. That means that for every goldbug buying the dip, many more may panic and sell their gold. This could easily turn to a rout, and gold may fall as low as the cost of production ($900), or even lower (especially considering gold’s high stock-to-flow ratio). Gold is a speculation in that it produces no return other than price rises. The last time gold got stuck in a rut, it was stuck there for almost 20 years. However, my case for physical gold as a small part of a diverse portfolio to act as a hedge against systemic and counterparty risks (default cascades, Corzine-style vaporisation, etc) still stands, and lower prices are only good news in that regard. The financial system retains very many of its pre-2008 fragilities as the deregulated megabanks acting on margin continue to speculate in ways that systematise risk through balance sheet interconnectivity. Another financial crisis may initially lower the price of gold on margin calls, but in the long run may result in renewed inflows into gold and a price trend reversal. Gold is very much a barometer of distrust in the financial, governmental and corporate establishment, and as middle class incomes continue to stagnate and income inequality continues to soar there remain grave questions over these establishments’ abilities to foster systemic prosperity. That means that the American financial sector is a zombie, existing on the teat of the taxpayer. It means the huge swathes of liquidity spent on saving the financial sector are ultimately good money chasing after bad. The U.S. financial industry — with almost $9 trillion in assets, more than half the size of the U.S. economy — would just about break even in the absence of corporate welfare. In large part, the profits they report are essentially transfers from taxpayers to their shareholders. Neither bank executives nor shareholders have much incentive to change the situation. On the contrary, the financial industry spends hundreds of millions of dollars every election cycle on campaign donations and lobbying, much of which is aimed at maintaining the subsidy. The result is a bloated financial sector and recurring credit gluts. This is extremely prescient stuff. The Fed since 2008 has reinflated the old bubbles, while allowing the same loot-and-pillage disaster-corporatist financial model to continue. It is insane to repeat the same methods and expect different results. This credit glut, this new boom that has seen stocks rise closer and closer to their pre-crisis high (which may soon be exceeded) will just lead to another big 2008-style slump, just as the Fed’s reinflation of the burst tech bubble led to 2008 itself. This time the spark won’t be housing, it will be something else like an energy shock, or a war. Something that the Federal Reserve cannot directly control or fix by throwing money at it. America (and the Western world in general) post-2008 needed real organic domestic growth built on real economic activity, not a reinflated bubble that let the TBTF financial sector continue to gorge itself into oblivion. The Dodd-Frank regulatory hyperinflation crowds out those who cannot afford teams of legal counsel, compliance officers, and expansive litigation. Dodd-Frank creates new overheads which are no challenge for large hedge funds and megabanks armed with Fed liquidity, but a massive challenge for startups and smaller players with more limited resources. The law requires Hedge Funds to register with the Securities and Exchange Commission, supply reams of sensitive data on trading positions, carefully screen potential investors, and hire compliance officer after compliance officer. So, is this expansion in volume likely to improve financial stability? No — the big banks are bigger and more interconnected than ever, which was precisely the problem before 2008, and they are still speculating and arbitraging with very fragile strategies that can incur massive losses as MF Global’s breakdown and more recently the London Whale episode proves. Catching a frisbee is difficult. Doing so successfully requires the catcher to weigh a complex array of physical and atmospheric factors, among them wind speed and frisbee rotation. Were a physicist to write down frisbee-catching as an optimal control problem, they would need to understand and apply Newton’s Law of Gravity. Yet despite this complexity, catching a frisbee is remarkably common. Casual empiricism reveals that it is not an activity only undertaken by those with a Doctorate in physics. It is a task that an average dog can master. Indeed some, such as border collies, are better at frisbee-catching than humans. frisbee-catching dog follows the simplest of rules of thumb: run at a speed so that the angle of gaze to the frisbee remains roughly constant. Humans follow an identical rule of thumb. Yet despite this complexity, efforts to catch the crisis frisbee have continued to escalate. Casual empiricism reveals an ever-growing number of regulators, some with a Doctorate in physics. Ever-larger litters have not, however, obviously improved watchdogs’ frisbee-catching abilities. No regulator had the foresight to predict the financial crisis, although some have since exhibited supernatural powers of hindsight. So what is the secret of the watchdogs’ failure? The answer is simple. Or rather, it is complexity. Big, messy legislation leaves legal loopholes that clever and highly-paid lawyers and (non-) compliance officers can cut through. Bigger and more extensive regulation can make a system less well-regulated. I propose that this is what the big banks will use Dodd-Frank to accomplish. I predict that the regulatory hyperinflation will make the financial industry and the wider economy much more fragile. Wall Street is buzzing about the annual report just put out by the Dallas Federal Reserve. In the paper, Harvey Rosenblum, the head of the Dallas Fed’s research department, bluntly calls for the breakup of Too-Big-To-Fail banks like Bank of America, Chase, and Citigroup. Second, the Fed already had a number of fantastic opportunities to “break up” so-called TBTF institutions: right at the time when it was signing off on the $29 trillion of bailouts it has administered since 2008. If the political will existed at the Fed to forcibly end the phenomenon of TBTF, it could (and should) have done it when it had the banks over a barrel. So the Fed is guilty of crystallising and perpetuating most of these problems with misguided interventionism. And what’s the Fed’s purported answer to these problems? 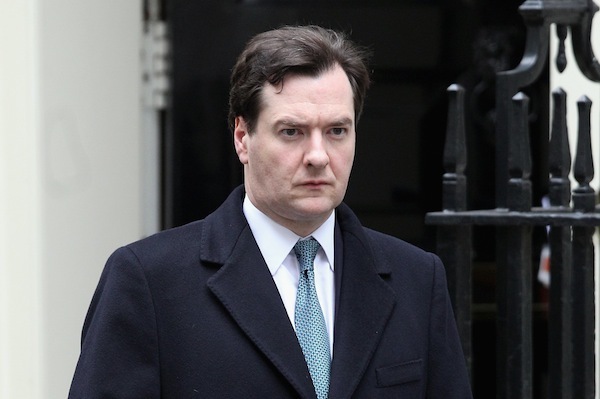 More interventionism: forcibly breaking up banks into chunks that are deemed not to be TBTF. And what’s the problem with that? Well for a start the entire concept of “too big to fail” is completely wrong. 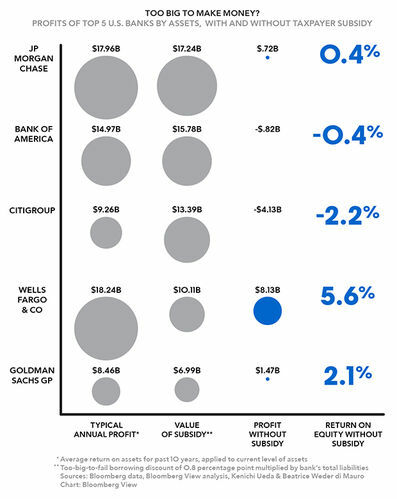 The bailout of AIG had nothing to do with AIG’s “size”. It was a result of systemic exposure to AIG’s failure. The problem is to do with interconnectivity. The truth is that AIG — and by extension, the entire system — was deemed too interconnected to fail. Many, many companies had AIG products on their balance sheets. If AIG had failed (and taken with it all of that paper, very generously known as “assets”) then all those companies would have had a hole blown in their balance sheets, and would have sustained losses which in turn may well have caused them to fail, bleeding out the entire system. The value that seems to matter in determining systemic robustness is the amount of systemic interconnectivity, in other words the amount of assets on balance sheets that are subject to counter-party risk (i.e. which become worthless should their guarantor fail). Global nominal exposure is growing again. 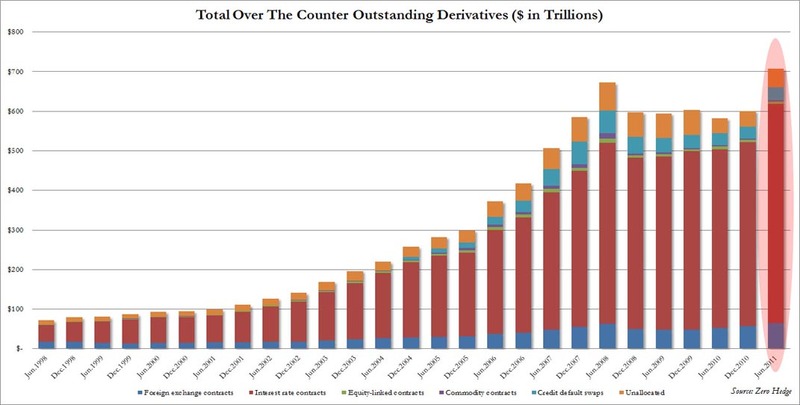 And those derivatives sit on global balance sheets waiting for the next black swan to blow up a hyper-connected counter-party like AIG. And such a cascade of defaults will likely lead to another 2008-style systemic meltdown, probably ending in another goliath-sized bailout, and another few rounds of the QE slop-bucket. The question the Fed must answer is this: what difference would it make in terms of systemic fragility if exposures are transferred from larger to companies to smaller ones? Breaking up banks will make absolutely zero difference, because the problem is not the size but systemic interconnectivity. Losses sustained against a small counter-party can hurt just as much as losses sustained against a larger counter-party. In a hyper-connected system, it is possible for failed small players to quickly snowball into systemic catastrophe. The Fed (as well as the ECB) would do well to remember that it is not size that matters, but how you use it. As many as 27% of all student loan borrowers are more than 30 days past due. In other words at least $270 billion in student loans are no longer current (extrapolating the delinquency rate into the total loans outstanding). That this is happening with interest rates at record lows is quite stunning and a loud wake up call that it is not rates that determine affordability and sustainability: it is general economic conditions, deplorable as they may be, which have made the popping of the student loan bubble inevitable. The reality of this — like the housing bubble before it — is that a lot of people who borrowed a lot of money can’t repay. That could be down to weak economic conditions. As I wrote yesterday, an unprecedented number of young people are unemployed and underemployed. These circumstances will lead to delinquencies. But I think that there is a key difference. Unlike housing — which will probably never be made obsolete — it feels like education is undergoing a generational shift, much like agriculture did prior to the Great Depression, and much like manufacturing did prior to the Great Recession. However, all this really shows is the (quite obvious) reality that colleges — subsidised by Federal student loans guarantees that act as a price floor — can keep raising tuition fees even while in the real world the economy is contracting. But education is suffering from a much bigger problem: a lot of what it does is gradually (or quickly) being made obsolete by technology. While college degrees for vocational subjects like medicine, law, architecture and so forth are still critically important (not least because access to such professions is restricted to those who have jumped through the proper hoops), non-vocational subjects have been cracked completely open by the internet. Why would anyone realistically choose to pay huge amounts of money to go to university to learn mathematics, or English literature, or computer science or economics when course materials — and much, much, much more including access to knowledgeable experts and professionals — is freely available online? The answer is for a piece of paper to “qualify” the holder and “prove” their worth to prospective employers. But with earnings for degree holders at roughly 1997 levels, what’s the point? Plenty of people with good ideas, drive and perseverance are living fulfilling and successful lives without a college degree — including me. There are flashier examples like Zuckerberg, Jobs, and Gates, but that is just the tip of the iceberg. Why would people want to go to university? All it shows is that you are lazy, and can’t be bothered to find a proper job, and want to spend three or four years getting up late and getting drunk. A useful (though not universally true) heuristic. “Education” has been turned inside out. To some employers, a degree (particularly one with a weak or mediocre grade) can in fact be a disadvantage. People without a degree can get ahead with three or four years of experience in industry. So while we wait to see whether or not a student loan meltdown will lead to a wider financial meltdown (a la Lehman), I think we should consider that this industry may well be on the brink of a systemic meltdown itself. With severely decreased demand for education, a lot of schools and courses may be wiped off the map leaving behind a skeleton of only the most prestigious universities, and vocational and professional courses.